Def Leppard and KISS played show 25 of their Summer Tour 2014 last night in Saratoga Springs, NY and here are the setlist statistics. 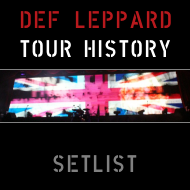 The show took place at Saratoga Performing Arts Center with 14 full songs played by Lep. View all the stats below after 25 shows. 13 of these songs were played at the last Saratoga Springs show in August 2012. 'Rock Of Ages' was last played in Saratoga Springs on 2nd August 2011 during the Mirrorball tour. It was left out in 2012 due to Joe's vocal issues.